22 inch White Cedar Suet Log offers plenty of room and food for all of your clinging birds. 5 easy to fill holes keep suet available. Try our variety of molded suet for easy filling. Fill our Suet Logs with our ready to fit Suet Plugs (3-pack). Available in "Peanut", "Insect or "Hot Pepper"(which the birds love but the squirrels hate). 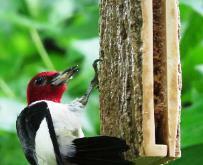 The tail prop on this feeder will encourage your woodpeckers to feed from this feeder. 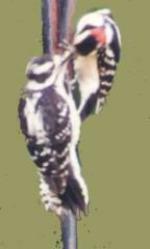 It is more natural for woodpeckers to use their tail as a prop when feeding. 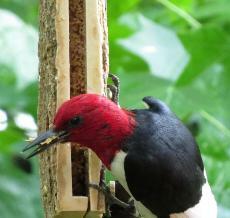 Your Pileated Woodpeckers will enjoy this feeder as much as this Red-bellied. 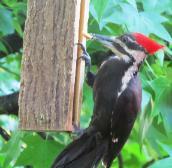 See how the woodpecker uses his tail for extra support. 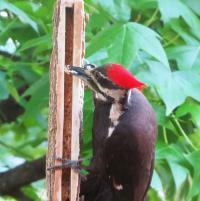 The upside/down suet feeder is a favorite for all clinging birds but trouble for starlings and grackles. A cute "Acorn Design" peanut feeder made from recycled milk jugs and plastic. Fill with shelled peanuts or sunflower seed. Designed by Steve Garr ...a BIV Exclusive! Make a memory....and enjoy it all year long! Make this adorable- and durable- Bird Feeder! ONLY requires a screw driver to construct. Kit comes complete with all screws and hardware, easy-to-follow instructions with pictures, and recipes for our favorite home-made suets! Attracts Nuthatches, Chickadees, Titmice, Wrens, ALL Woodpecker species, and even Bluebirds. 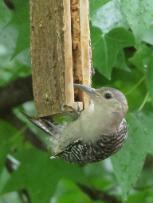 The sturdy "tail prop" at the bottom of the feeder accommodates larger woodpeckers.